Tea & Trumpets: Sibelius at 150! Nothing speaks of Finland’s pride and patriotism like Jean Sibelius’s music. As December, 2015 draws near, concert halls in Finland, and for that matter, all over the world will be celebrating the 150th anniversary of the Sibelius' birth with the composer’s best-known compositions. As the musical spokesman for Finland’s covert nationalism, Sibelius wrote his chef d'oeuvre Finlandia, a symphonic poem, in 1899 then revised it the following year. It commences with pompous brass and percussion before charting the rollicking melody that gives the piece a military air. In a departure from the published repertoire, Valse Triste was selected as the second of Sibelius’s works to be performed. By contrast to the melodic Finlandia, the short orchestral work is positively melancholy. As explained in host Christopher Gaze’s introduction, it was originally scored as incidental music for his brother-in-law’s play Kuolema, but is now accepted as a stand-alone concert piece. Next, Maestro Gerrard welcomed sixteen-year-old protégé Melody Ye Yuan, the first of two soloists to perform with the orchestra. Ms Ye Yuan, dressed in a Lent appropriate purple dress (probably coincidental) displayed intensity and sensitivity in performing the first movement (allegro moderato) of Sibelius’s Violin Concerto in D minor. Both soloist and conductor got into their respective strides right from the first notes. 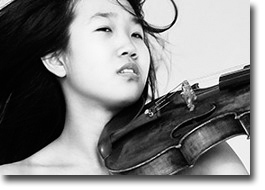 The young violinist showed maturity of musicianship in this very difficult work. Another programme departure brought only the first movement from The Karelia Suite. The popular intermezzo is a lively march like theme that entices the audience into wondering: where-have-I-heard-it? I’m sure it has been featured on several soundtracks, but I recall its use at the conclusion of a few episodes of the television show The Mentalist. The Swan of Tuonela is a tone poem scored for a small orchestra. Principal oboist with the Vancouver Symphony Orchestra, Beth Orson stepped forward from the woodwind section to represent the voice of the swan on solo cor anglais (pitched slightly lower than the oboe). The music is evocative of a single mystical swan inhabiting the island of the dead.